Non-filers Monitoring System (NMS) – Beware! If you have not filed income tax return and deposited old high denomination notes in your account above the threshold limit. Get ready to hear from Income tax department. 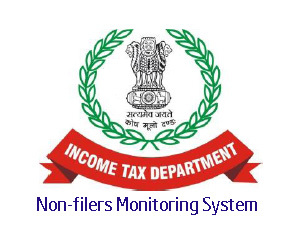 Income Tax department has started issuing non-compliance notice under non-filers monitoring system.Non-filers monitoring system is introduced by income tax department to find out potential tax evaders. If you have done any high-value transactions and not filed your income tax return or not paid income tax honestly you are likely to get notice. The Non-filers Monitoring System (NMS) identifies potential tax liabilities of tax evaders based on data mining and analytics. Non-filers monitoring system dig out data from various sources such as Annual Information Return (AIR), Centralized Information Branch (CIB) and TDS/TCS statements. The identified non-filers will be issued with non-compliance notice via SMS, e-mails, and letters. The non-filer has to submit the response to this notice online on the e-filing website of Income tax. 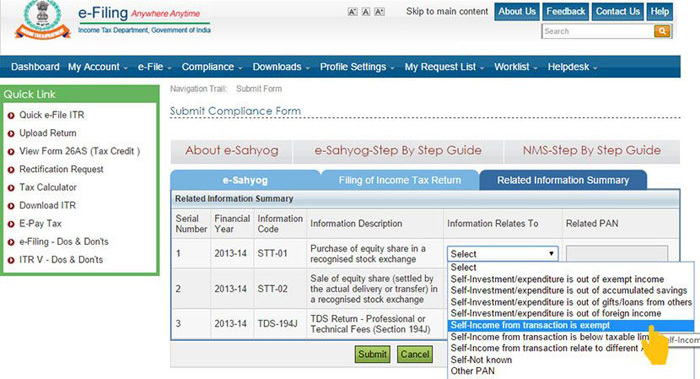 How to check Non-Compliance status online? Login to http://www.incometaxindiaefiling.gov.in/. If you don’t have an account, create one. Go to Compliance tab and click on ‘View and Submit Compliance”. If you have not filed ITR and done a high-value transaction you will see “Filing of Income Tax Return” tab showing status as per record “Return not received” in respective assessment years. If you choose that ITR has been filed you need to provide a mode of filing a return (e-file or paper), date of filing return and acknowledgment number. 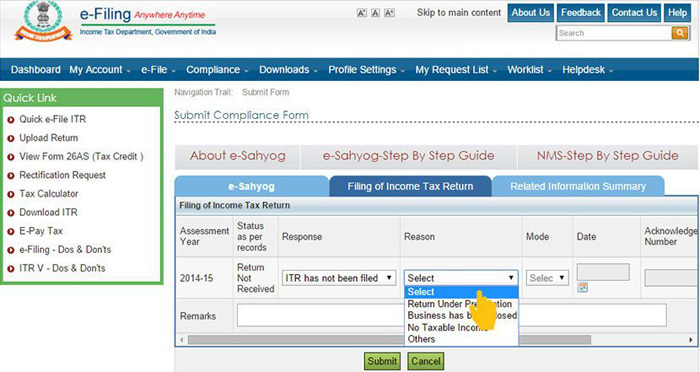 If you have not filed ITR you have following option to select under reason tab. If you select others you need to compulsory fill detail under Remarks section. Once you have completed with Filing of Income Tax Return section you need to click on tab Related Information Summary Tab. In this tab, you will find Information description provided by third parties. You need to choose an option from the drop down selection menu Information Relates To. Following options will be given for selection. Once you complete the selection click on Submit button. Your response will be submitted screen will display Response PDF. You should save and take print of PDF response for your reference. Your response will be verified by Income tax department and if found satisfactory, the issue will be closed. You can check the status online after some time. Until 2013 my wife was working and she has up to date IT returns. Later she left the job so stopped IT returns filing as no income. I had a looked in to her account statement between April 2014 – March 2015. I noticed there are couple of cash deposits around 5L , and her PF refund around 3.8L. So I think she received a letter because of total deposit is more than 10L. So amount deposited might be from couple of reasons like her previous savings some one borrowed and returned now , some cash might be I gave her for family maintenance , some 3.8L is from her PF withdrawal. I am not expert in Income Tax.However, I think you should ask more information.Notice is issued because cash transaction of 5 Lac.Kindly check cash transaction link in your wife e-filing login.Take advice of expert CA before replying to NMS system. I forgot to fill return for Assessment Year 2014-15 and I got ‘ Non-Compliance’. Section 192A is for TDS deduction by the employer.In your case it seems that you have got notice because TDS is deducted and you have not filed notice. It is possible in the case where you have spend more amount like Paid Rs 2 lac or above against credit card. In Information Related to tab you can select I need more information and ask for more information.